October, the time of the year when people usually come down with a cold or the flu. It’s usually when the season changes, summer is gone and the cold wind from the mountains starts nipping at our immune system. We put away our shorts and T-shirts and put on a sweater. School has begun and parents want to make sure their kids are fit and healthy to start the school year, so they start giving them all sorts of vitamin supplements etc.. But according to scientific studies, supplements sold over the counter including Vitamin C, Zinc or Echinacea are not very effective in prevention of a cold and the flu. What really works is a good nights sleep of at least 6-8 hours a night, as much exercise as possible – ideally 4 times a week, healthy food and a positive mindset. After a few minutes of picking, I ended up with 2 cups of elderberries. There are dozens of uses for Elderberries. I was tempted to put them to good use, anything from Jam, to a tincture should be good. Jam it is. Jam is very versatile, rich and fruity. 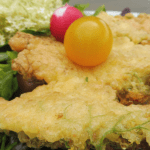 You can spread it on bread or serve it up alongside a cheese platter or other savory winter comfort foods. Alternatively swirled it into your morning yogurt. 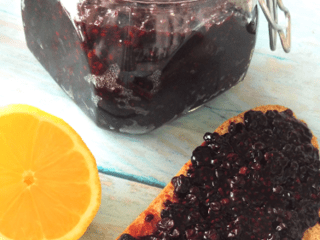 To make a jelly-like substance, we replaced traditional pectin with chia seeds. Chia seeds have, among other abilities, the capability to transform any liquid into a jelly like substance. To achieve the ideal consistency, we recommend cooking the fruits a little to release their juices before mixing in the chia seeds. Chia seeds are rightfully named a superfood. They are rich in protein, fiber, manganese, phosphorus and calcium. They are an excellent source of antioxidants and omega -3 fatty acids and are responsible for reducing the risk of many adverse health conditions, including obesity, diabetes and heart disease. You can combine Elderberries with other fruits to enhance their taste and use them as natural sweeteners. Combine them with apples, pears, grapes or mango. However to achieve a deep purple color we decided to use blueberries – not only do they constitute a delicious blend when mixed with the elderberries, they are also high in antioxidants, low in calories and can help maintain brain function and improve memory. 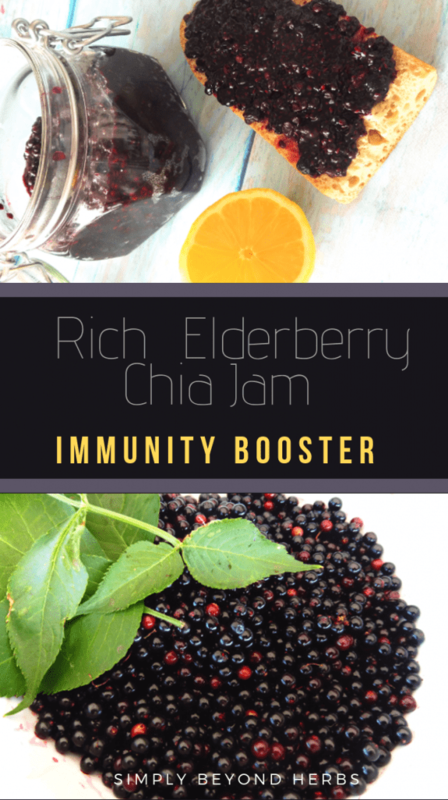 Elderberry together with Chia seeds make a powerful combination full of antioxidants and anti-inflammatory substances that can help you overcome this demanding flu and cold season. 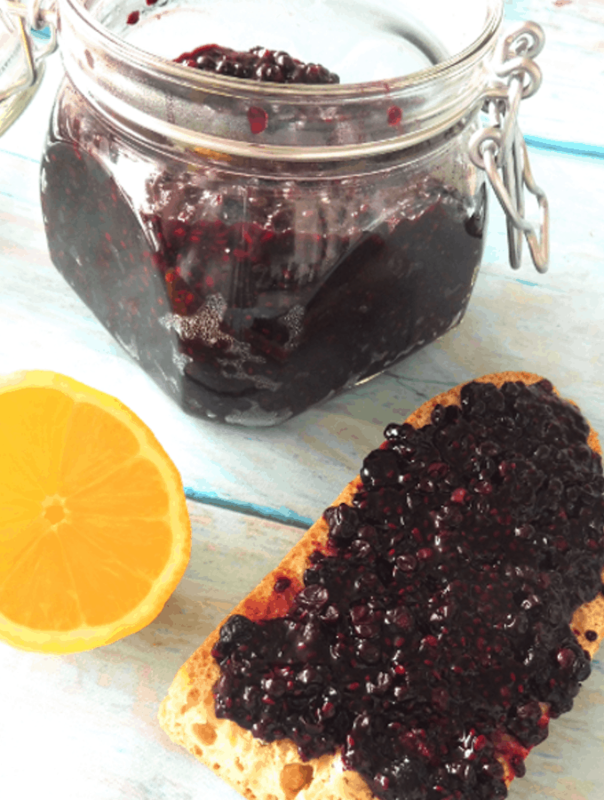 Rich and exquisite Elderberry jam can be spread over your toast or just served up alongside a cheese platter. 2 spoons chia seeds - start with this amount and depending on the juiciness of the fruits, stir more chia seeds in. 1. Rinse the berries and then pluck the berries off the stems. 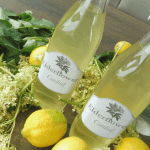 Remember that the stems and seeds of elder contain toxins and need to be removed. 2. Place the berries into a large saucepan and bring it to a boil. Lower the heat. 5. remove it from the heat and add vanilla extract and sweetener of your choice. I don't like too sweet jams so I added just 2 table spoons of raw honey to our mixture. Feel free to add as much as per your liking. To separate the berries from the rest of the plant , you can either use the fork, use your fingers (as I did) or freeze the harvest overnight and tug the berries off the stems while they are still frozen. I’m such an elderberry fanatic this is freaking amazing. OMG this looks amazing!! I typically bring a cheese plate to all of our family holiday parties… I am definitely going to have to make this along with it! Such an awesome idea! Thank you for sharing! What a great idea! 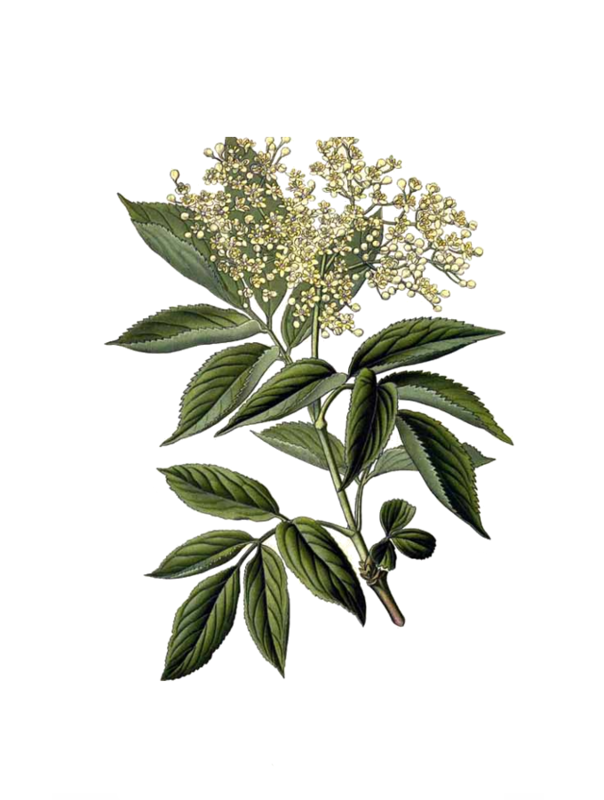 I make elderberry syrup every year, but I hadn’t thought of using elderberries for jam. I love the chia component as well! I need to make this! What a great was to fight off colds and have something that looks absolutely delicious 😋I have so many jars too, so this will be a great excuse to reuse them. I love this idea. 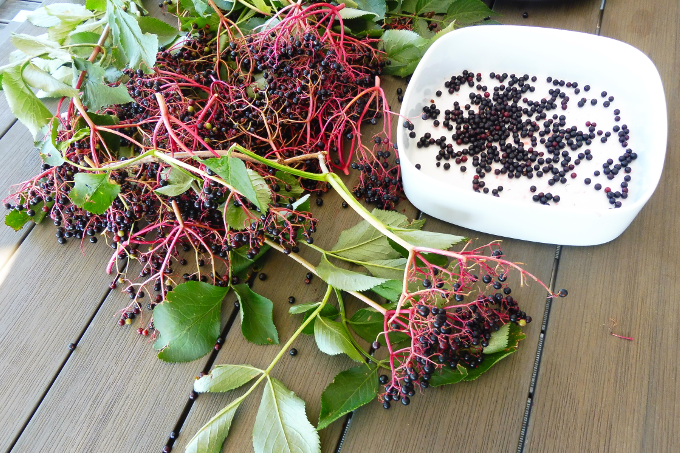 We have lots of elderberries growing around here and often forage them to make a tincture, but have never tried a jam! The notes say to remove the seeds, but how is that even possible with elderberries? I don’t see that was done in the video? Also, can this be made using dehydrated elderberries? I’d think you would add equal amounts of water and dried berries? Finally, can this be water bath canned to make it shelf stable? 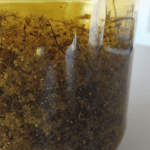 Looks like a fantastic recipe, and a tastier way to get the good stuff into me than strong tinctures. Thanks for posting! Hello, thanks for coming over. In the notes I mentioned “To separate the berries from the rest of the plant” which is advice when you harvest the berries and need to remove them from the plant, nothing about seeds. 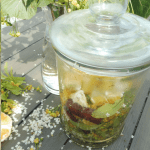 Don’t remove the seeds, they are part of the jam. I haven’t tried to make it from dehydrated but I would let them soak over night and see it they are juicy enough. Frozen would be better if you can get them. Thank you for this great information. I appreciate the thought of providing us these list. This article will be of good use to us.